Bournemouth Air Festival 2019. The airshow in Bournemouth. Bournemouth's Air Festival celebrated its 10th anniversary in 2017 and in that decade became the best-attended seaside airshow in the UK. The Festival is well supported locally and has a reputation for innovation. In 2010 it was the first show to introduce dusk flying with LEDs and Fireworks. It has good support, too, from the RAF teams and a naval contribution. The Red Arrows are loyal supporters of the show but in 2019 they will not be able to display because of their planned nine-week tour of the USA and Canada in August and September. The RAF Chinook Display Team will, however, be at the show. They will display on three of the four days, Friday, Saturday and Sunday - the only seaside show to get a trio of appearances. 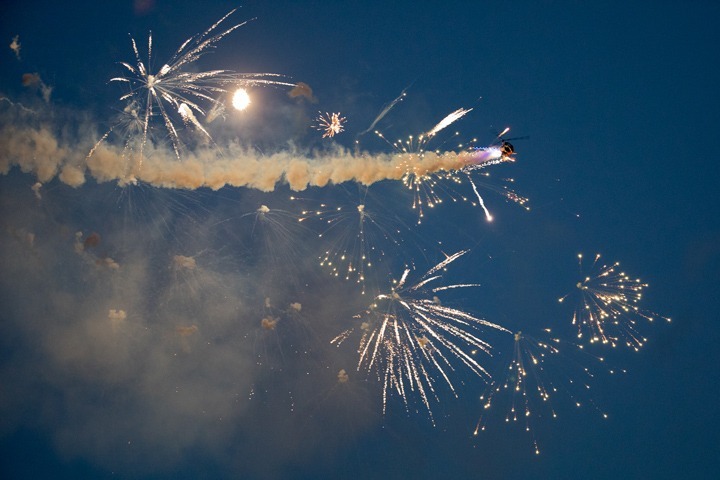 RIAT is the only other show to be awarded as many displays. The RAF's Typhoon display team will also return to Bournemouth, one of the most called-for displays, not seen at the festival since 2016. There is are generally one or more boats moored off the beach and most years it is possible either to visit or to sail around one of them. Details for 2019 to be advised. 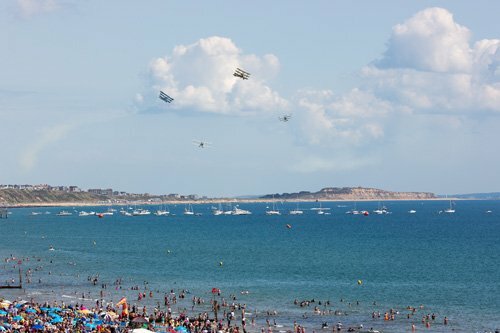 Bournemouth's first airshow, called the Bournemouth Air Festival, was held in August 2008. It has grown in size and popularity since then, rivalling traditional seaside airshows such as Eastbourne. 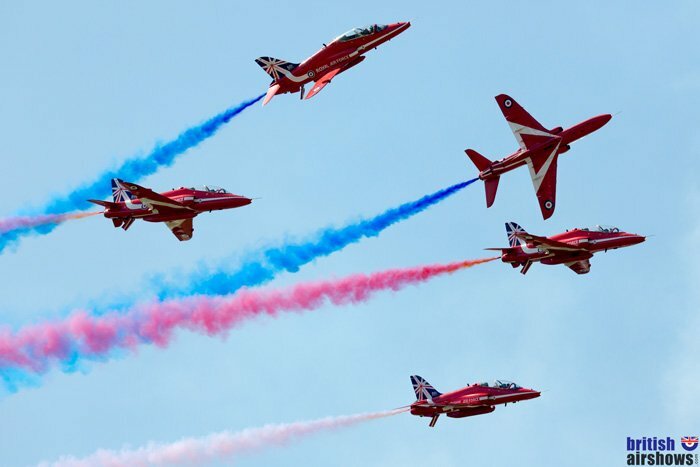 Like Eastbourne's Airbourne, it is held from Thursday to Sunday along the seafront and offers sea-based events and static displays as well as military, historic and aerobatic air displays. There may be some kind of beach assault or air-sea rescue re-enactment, a lot of participation by all three armed services and some dusk or early evening flying. Bournemouth's sea front is seven miles long. 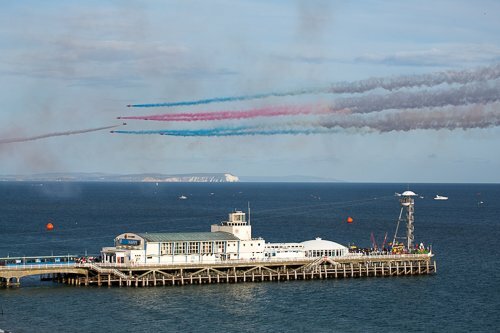 The air displays can be seen from most points, including the pier and the balconies of sea front hotels but the best viewing is from the centre of the flying line, between Bournemouth and Boscombe piers, either at sea level or from above on a road called East Overcliff Drive. Let's be honest, the 10th anniversary Air Festival in 2017 wasn't Bournemouth’s best Airshow. The aircraft line-up was lacklustre and the weather was atrocious. However, in 2018 the show made amends. The flying programme was amongst the best of all seaside shows and included several displays not seen elsewhere in the country: and the weather was the best for almost a decade. 2018 was the year when the Bournemouth Air Festival regained the crown as the best seaside show in the UK. Most of the highlights came from displays not previously seen at Bournemouth. The highest profile was the display by the six L-39 Albatros jets of the Breitling Jet Team, the world’s largest professional civilian flight team flying jets. 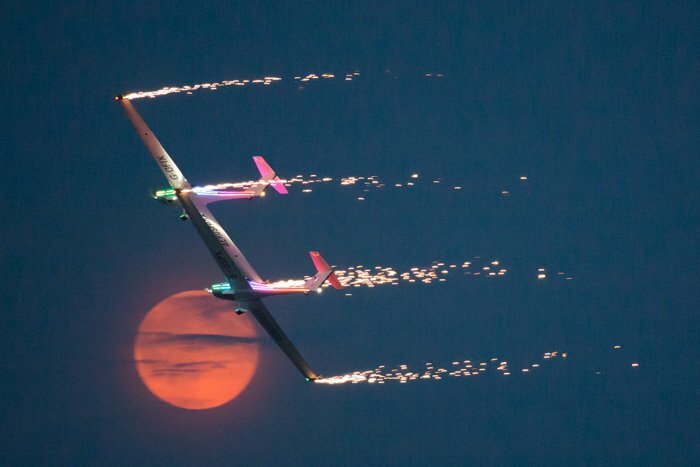 The team displayed on Friday, Saturday and Sunday during the daytime and also on Saturday at dusk. These were the only displays by the team in the UK in 2018. Another treat at Bournemouth, not seen elsewhere, was the first public display by two pilots from Gravity Industries wearing personal jet suits. A single pilot, founder and chief test pilot Richard Browning, has displayed at Goodwood Festival of Speed and Farnborough International Airshow, but always on his own. At Bournemouth he was joined by Dr Angelo Grubisic, who is a university professor and wingsuit proximity BASE jumper amongst other things. See more below. A third highlight, as he is everywhere he flies, was Richard Goodwin in his very modified Pitts Special, which he calls the 'Muscle Biplane' and which bears the very appropriate registration G-EWIZ. Richard has become very well know and extremely well respected everywhere he flies but, surprisingly, this was his first time at Bournemouth. Local people soon found out what they had been missing as Richard entered stage right in a knife-edge all along the crowd line on the cloudy days but in a corkscrew from great height at the weekend when the weather allowed, turning as many as 13 spirals before levelling out. Understandably, the crowd called out "he's bonkers" as he made the Pitts appear totally out of control in twists and tumbles, but always returning to the straight and level - not necessarily the right way up. I really don't think he minds being called bonkers. He might even agree. Many seaside shows make a claim to be the biggest. Of course, that depends how 'big' is measured, but in terms of crowd size the show at Bournemouth probably was. It is estimated that just over a million visitors attended in 2018; 460,000 on Saturday alone and although it cost around £800,000 to stage, the benefit to the local economy could be over £30 million. 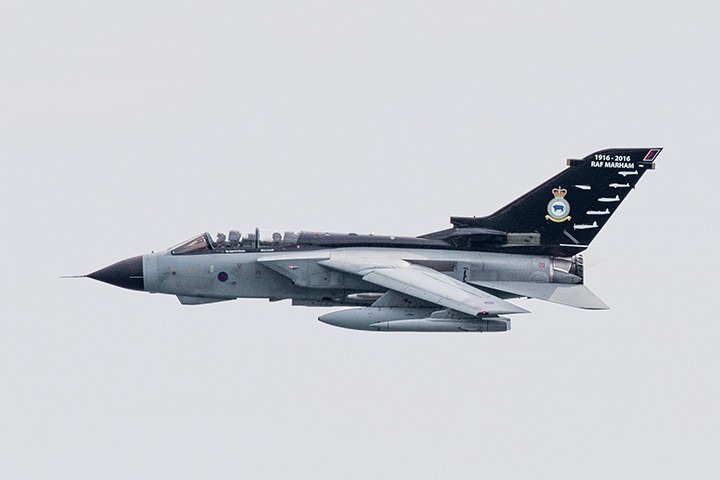 A last minute addition to the flying on Thursday was a Tornado GR4, which made a single pass at 1,000 feet to open the flying, immediately before the display by the Battle of Britain Memorial Flight. That BBMF display was reduced to a Spitfire followed by the Dakota when the Hurricane developed a technical problem. The rest of the day went as planned, including a spectacular dusk display by the Fireflies, Twisters and Otto. The Hurricane was fixed and flew on Friday, Saturday and Sunday, as did everything else on the schedule, including a full 'Night Air' programme of The Tigers Parachute Display Team, the Fireflies with the Twisters and Otto on Friday and the same again but with the Breitling Jet Team instead of the Tigers on Saturday. Friday was also the first public display by the Gravity Jetsuit pair. On Friday at lunchtime and before 'Night Air' both took off from Bournemouth pier and flew over the water; Richard continuing to the parachute landing beach halfway to Boscombe pier. On Friday Angelo dropped into the water just short of the Gravity base about half-way to the parachute landing beach. When they flew on Saturday at lunchtime it was Richard's turn to end up in the water just short of his landing spot. Damage to the equipment as a result of the two dunkings meant that Saturday's planned dusk display had to be cancelled. Apart from the final run of the Jetsuit pair and Thursday's BBMF Hurricane display, everything else in the programme flew and most displays were more or less at the published times: very unusual indeed for an airshow these days. Great War Display Team. Six WW1 fighters on Saturday and 7 on Sun. Strikemaster pair, G-SOAF and G-RSAF (all four days). Also a flypast with the Vampires and MiG on Sunday. MiG-15. Solo and flying with the Vampires on Saturday. Solo and a flypast with the Vampires and the Strikemasters on Sunday. 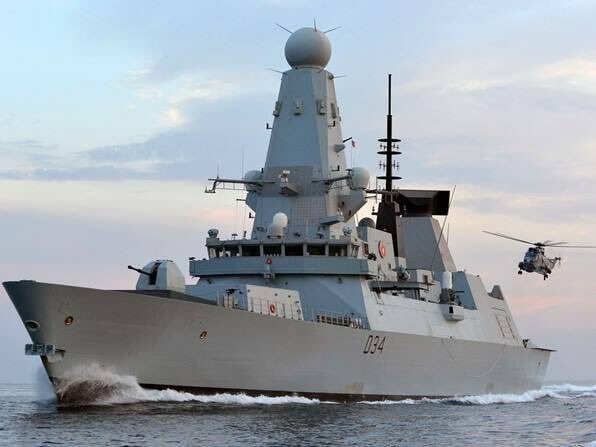 During the Bournemouth Air Festival, for £10 per adult or £5 per child, visitors aged 10 years old or over could take a 45-minute boat trip to see HMS Diamond, a Type 45 Destroyer, although there was no boarding. 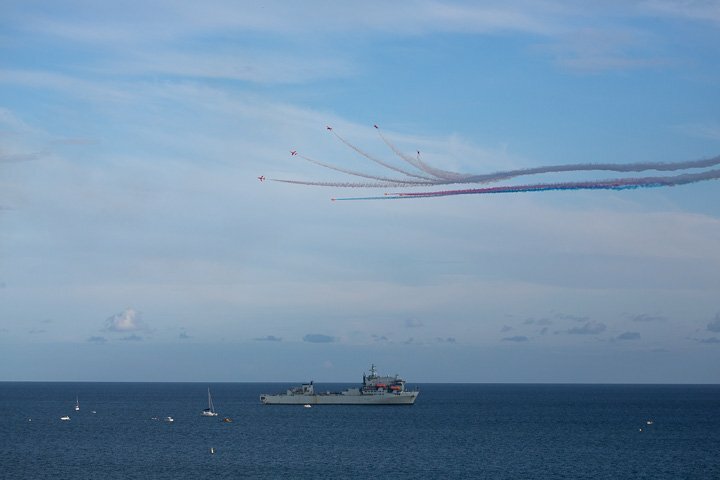 This was the tenth anniversary of one of the UK's premier seaside airshows with input from the RAF, Army and Royal Navy, as well as civilian displays. A special show might have been expected for such an occasion and there was certainly plenty on the ground for the whole family around the pier and along the entire stretch between Bournemouth and Boscombe piers, both at sea level and in East Overcliff Drive above. There was also a great dusk programme, with excellent variety: a flowing, aesthetic display from the Twisters; dynamic multi-coloured fireworks from Brendan O’Brien in Otto and both solo and combination descents from the Red Devil Parachute Display Team. For such an anniversary, however, many might feel that overall the flying displays were not as auspicious as the occasion warranted. RFA Argus was the landing platform for the Merlin helicopter that supported an assault demonstration, when troops and heavy vehicles showed how they would deal with a threat on the beach. There was a practice on Friday and a full demonstration on Saturday and Sunday: the Saturday assault accompanied by rather fast and distant passes by a pair of Hawks from RAF Culdrose. On Sunday the Merlin supporting the beach assault demonstration, but without the Hawks, was the only flying. All other displays were cancelled because of poor visibility, high crosswinds and the forecast of rain. Cancellations are always a pity, but Sunday's cancellation was especially unfortunate because it promised to have one of the highlights of the weekend: a six-ship vintage jet display to complement the 'Vintage Sunday' theme. Most of the jets, a Strikemaster, a Jet Provost, the MiG-15 and the Vampire pair had taken part in the Festival earlier in the week, but Sunday would have added a second Jet Provost and would have been the only opportunity to see all six. There is no fault on the part of the pilots or the Bournemouth team, who really had no choice given the conditions, but it was a pity that the weather got the better of the best efforts of the Festival Organisers. Although the Festival was well-served by the five vintage jets that did fly, many people bemoaned the lack of a modern jet, especially in the wake appearances by the Belgian F-16 at Eastbourne and Biggin Hill. The RAF did lend its usual support but it was without the Typhoon, which was committed to displays in Scotland and Northern Ireland, and the Lancaster, whose displays had been paused, along with other Merlin-engined BBMF aircraft, because of a technical issue. On the positive side, there were two appearances by the RAF Chinook: a flypast on Thursday and a full display on Friday. The Chinook was only booked for 11 public UK airshows in the whole of 2017, so the Friday display was a relative rarity this year. The Red Arrows were as popular as always. Red 9 was suffering the effects of food poisoning on Friday, so there was a chance to see an eight-ship display, but the full complement of nine flew on Thursday and Saturday. It was noticeable how the number of spectators walking around reduced, and the numbers along the barriers looking skywards increased, as Red 10 Mike Ling announced their arrival and took the hundreds of thousands of spectators through the team's manoeuvres. However, other Festival highlights are harder to identify. 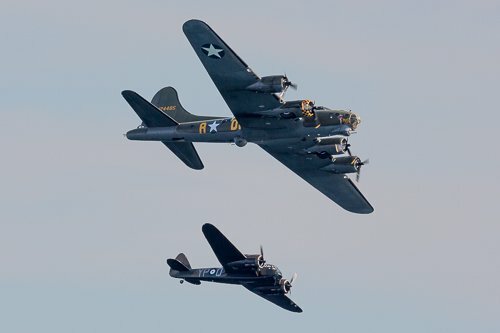 For us, along with the superb dusk-flying, at which the Bournemouth Air Festival excels, the combination of B-17G 'Sally B' and the Blenheim was certainly a contender. Seeing either of these WW2 bombers is always a treasure, but seeing them together, and being able to contrast their size and form, is not something that happens frequently, even though they share a home at Duxford. The Strikemaster is always a pleasure to behold, especially with the added dimension of a pairing with a Jet Provost on Saturday, and it was also good to see seven of the aircraft of the Great War Display Team, whose routine incorporating passes and tailchases easily puts the spectator in mind of the dogfights that would have ensued between the actual WW1 machines of which the display aircraft are excellent replicas. Overall, the Festival was a huge success. 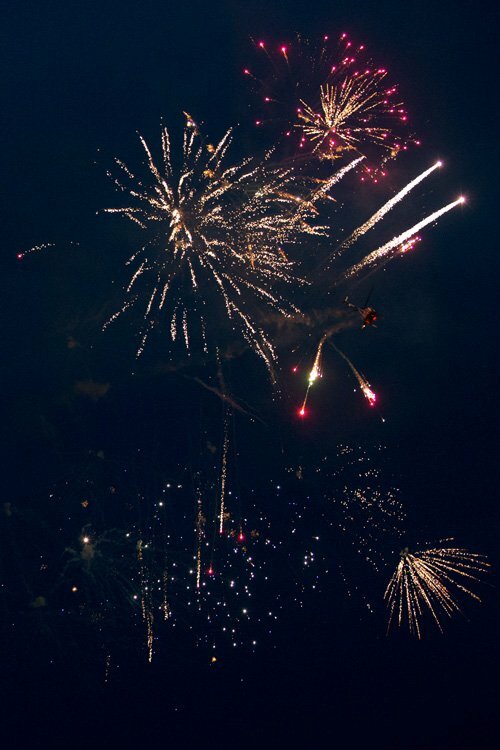 Despite a brief downpour on Thursday, and the weather cancellation of nearly all flying on Sunday, there was still plenty to keep the whole family joyfully occupied from after breakfast through to the dusk flying at 8pm and the fireworks at 10pm. The military villages were buzzing with activity and excitement and military music filled much of the interval between daytime and dusk flying. The beach concerts, including the free ones, were varied and to a high standard and children will have found lots to keep themselves and their guardians dipping into their pockets for rides and treats. Or for no money at all there are miles, literally, of sandy beaches, and one or two lawns for those who prefer grass, from which to watch the flying: a schedule of the aircraft is in the table. Despite this undoubted success there will be many who may question whether, despite some great performances, the total flying package was as special as a 10th anniversary event might deserve. We also felt that breaking the displays into three sessions on Thursday and having to give way to other priorities at Bournemouth airport meant that sequence was sometimes rather fragmented. Overall, as a family seaside festival we thought it was great. As an airshow we felt it was rather underwhelming. There was free live music on Thursday, Friday and Saturday. On Thursday: Rooster, a party band; on Friday: The Nick Ross Orchestra with Sam Merrick and on Saturday the beach was crowded for a superb Stevie Wonder tribute band called The Wonderband. There were also concerts (not free) at the Immense Air Aerobar on all four days featuring, through the week, Ed Sheeran Experience Tribute Act, Rio Carnival, Koh Pha Ngan Full Moon Party and Vintage Day and postcard pin ups. Not quite a match for last year's Kaiser Chiefs but tickets were only £5 in advance. There were fireworks at 10pm from the end of Boscombe Pier on Friday and Bournemouth Pier on Saturday. An issue with Merlin engines in the BBMF fleet is being dealt with. In the meantime, the Lancaster is airworthy and fighters are being brought back as they are cleared, although displays by some Merlin-engined BBMF aircraft remain paused. Unfortunately, even shows as well organized and as well supported as the Bournemouth Air Festival can suffer when the weather is unfavourable. And unfavourable it was. It was especially bad on Saturday, when there was no afternoon flying. Huge credit to the team at Bournemouth and the pilots. With conditions this bad, some shows would simply have cancelled. But Bournemouth managed to retain a huge chunk of the flying and move it along four hours, turning what could have been a disastrous flying day into a good dusk to evening programme. The Festival had already been affected, as shows invariably are, by cancellations ahead of the event. 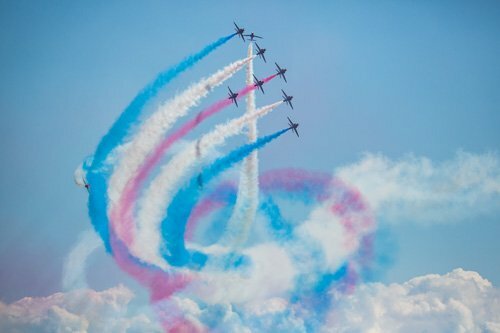 Bournemouth had been the only show in the UK to be awarded two displays by the Swiss Air Force. 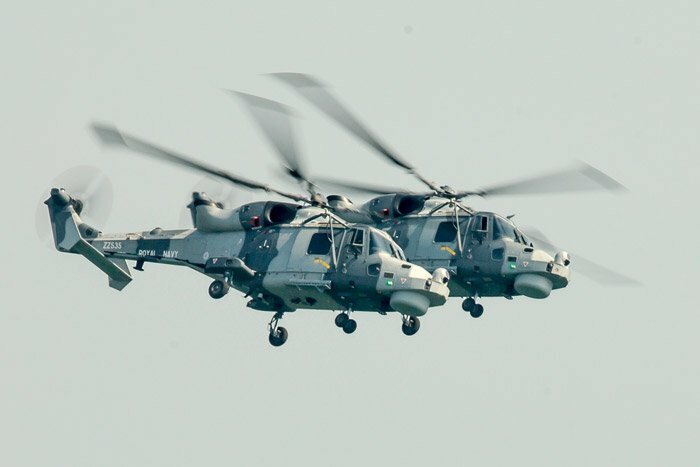 Unfortunately, the F-18 was subsequently cancelled, although the Super Puma did remain on the programme: the only UK show to be awarded the Swiss Super Puma in 2016. The show was also privileged to be allocated the Typhoon for three days, scooping a dusk display on Friday, and was the only show to have the Red Arrows and the Black Cats scheduled for all four days. The Bournemouth festival is always very well supported by the the naval fraternity. 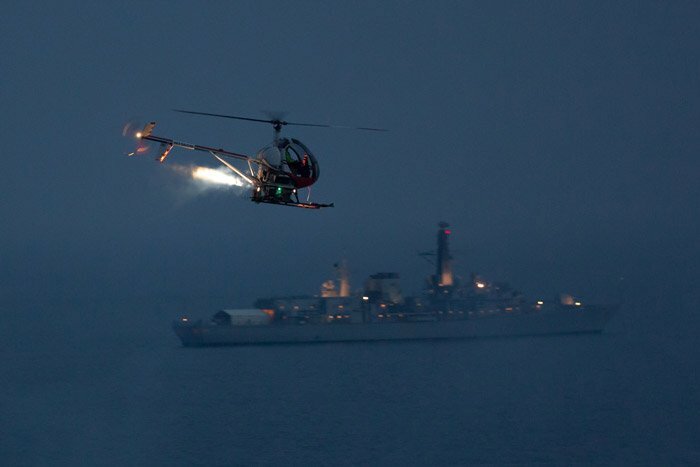 In 2016 both Royal Navy and French vessels: HMS Monmouth, HMS Grimsby, HMS Tyne, RFA Argus and FNS Sagittaire were all offshore adding to the spectacle, providing a photogenic backdrop to the views and to the flying displays and, in some cases, supporting amphibious Royal Navy and Royal Marine beach assault demonstrations when troops and heavy vehicles invaded the beach with support from helicopters launched from the ships. The small boats were moved further away from the display line following an extension of the maritime exclusion zone. The flotilla of small ships nevertheless also adds to the ambience, as do several of the coastal formations, such as the Needles to the east and 'Old Harry' to the west. Against this welcoming background the number and variety of aircraft involved in the flying was rather weaker than at previous Bournemouth Air Festivals. The cancellation of the Swiss F-18 was an early disappointment and the lack of a crowd-puller, such as previous years' Vulcan display and the absence of the hugely popular Chinook or the Sea Vixen appeared to have an affect on visitor numbers, further reduced by poor weather for much of the weekend. The official estimate for one of the better days weather-wise was 187,000 on Thursday. Against this background, Thursday's action in the air lifted to mood somewhat, with a plentiful programme including a bonus appearance by the BBMF with the Lancaster at official opening time around 10.30, and unprogrammed displays by the Swordfish, in formation with the Black Cats, and Sally B during the afternoon. Once again, the action began with a series of passes by a pensioner wingwalker, this year 85 year-old Dawn Goodson raising funds for a motor neurone disease charity, and continued more-or-less on programme, including a rolling display by the Red Arrows, ending with a spectacular series of dusk displays. The Fireflies, Otto the helicopter and AeroSPARX all lighting the dusk skies with LEDs and fireworks off the wings followed by a parachute jump by the Red Devils, who did keep everyone waiting quite a while as they kept gaining height, eventually to 5,000ft. Day two, Friday, began very wet, leaving many spectators fearful that the afternoon's flying might be affected. In the event the start was delayed by an hour but then, for the rest of this day at least, the elements allowed most of the flying to go ahead. The conditions were still gloomy to begin with but the low cloud lifted and even gave way to blue skies periodically although the gusty wind prevailed. The Swordfish was replaced by the Fireflies in the schedule but the weather at the end of the afternoon caused the cancellation of the Wingwalkers, Tigers and Red Devils. The evening flying did go ahead, though, including the Typhoon with a rare dusk display and its second display of the day. The weather forecast for Saturday was so bad that it was announced on Friday that Saturday's programme would not go ahead as planned. The organisers did manage to run an abbreviated deferred programme from about 5pm, however, although the dusk and evening activities were all called off. On Sunday the Great War display Team were cancelled and the Tigers didn't jump. The weather that disrupted the flying displays also caused the cancellation of ancillary events. The visits to the ships were affected by the weather and were cancelled on Saturday and Sunday and particular weather casualties were the music shows. The show area had to be cleared early on Friday because of exceptionally high tides, causing the star act, the Kaiser Chiefs, to be cancelled and all shows on Saturday were cancelled because of consequent damage to the stage. From the east, the M27 and A31 will get you close, then follow the signs. From the west, use the A35. Post Code (for sat nav) BH2 5AA will get you to Bournemouth pier but ignore the sat nav in favour of local directions signs as soon as you see them. There are links to route planners in the Travel Advice column if you prefer to plan ahead or don't have sat nav. Bournemouth and the surrounding roads are extremely busy during festival week so the organisers recommend the use of the (chargeable) park & ride schemes. National Express have coach services from London, Gatwick, and along the coast from Weymouth and Poole. Bournemouth is served by SouthWest trains to London and towns in Hampshire and Dorset; Virgin trains to the north, sometimes direct and sometimes via London or Coventry and by Southern's West Coastway service to Sussex towns via Southampton. The International Hotels Group have a Holiday Inn Express in Poole, about 10 miles to the west; Premier Inn have three hotels in Bournemouth and one in Christchurch, about 5 miles away.